Image above: Teddy and the Iris with the radio remote transmitter (bottom center), and his laptop which received data from the Iris during the flight. Photo from the S100 Infragram. 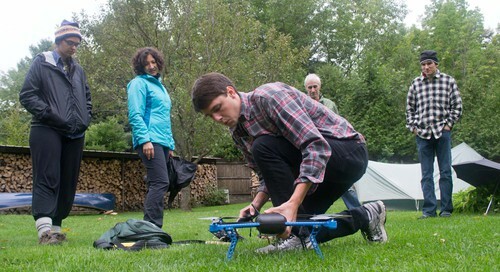 It was great to have Teddy spend Saturday at LEAFFEST with the quadcopter he has been using this summer. Teddy is a senior at Middlebury College and has taken aerial photos of agricultural and forest study sites with normal and Infragram cameras attached to a 3D Robotics Iris quadcopter. The cameras are Canon PowerShot S100s, one of which he converted to IR with a Wratten 25A filter. 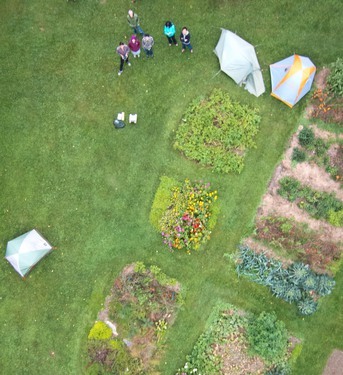 The poster session at LEAFFEST included one poster – of Teddy’s aerials of the Middlebury College Organic Farm. It generated an hour of discussion, and then there was an hour of flying in the backyard before the rain started. It was cloudy so there were no shadows, which is good for photography, but there was not enough light to get the best quality photos. I am not sure how the exposure settings were being determined (maybe by a CHDK script) but the ISO was consistently high on both cameras. The Iris lifts only one camera at a time, and the ISO was 500 with very fast shutter speed (e.g., 1/2000 second) on the Infragram camera flight, and ISO was 800 with slower shutter speed (e.g., 1/640 to 1/1000 second) on the RGB camera flights. So motion blur was minimized (although quite a few of the RGB photos were still fuzzy), but all of the photos have quite a bit of noise from the high ISO settings. Every photo was taken at f/2.8 which is the widest aperture on the S100. This also reduces photo sharpness, but is generally unavoidable. Teddy might eventually process the photos with his Photoscan workflow, but in the meantime I did some quick stitches in Microsoft ICE to see what kind of coverage there was. 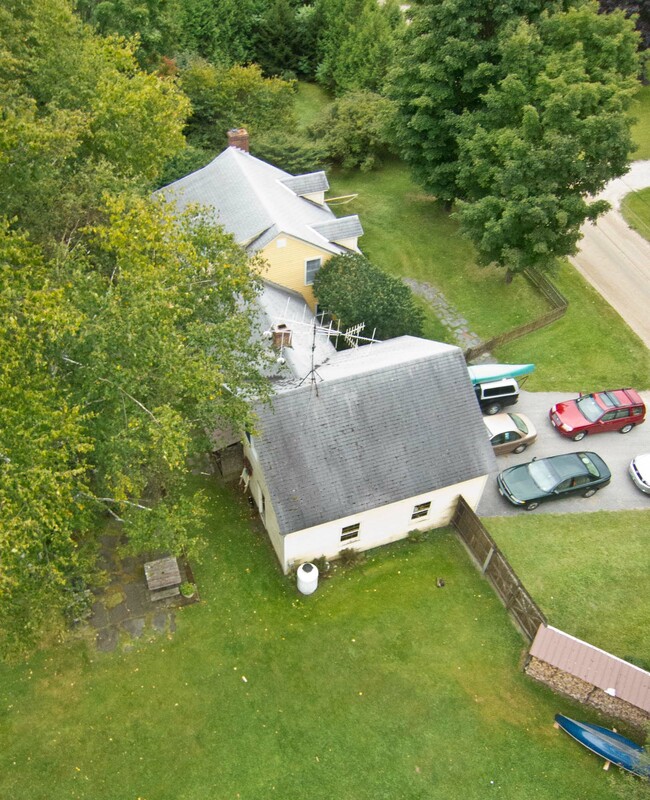 The backyard is surrounded by pretty tall trees, so the flights were straight up, some minor excursions over the yard, and then right back down. This was repeated with the RGB and Infragram cameras attached. I selected 16 or 17 photos from the top of each flight to stitch together, but there was lots of overlap among them, so the final mosaics cover little more than what two side-by-side photos would cover. I guess because there was so much overlap, ICE had no problem stitching all of the photos together, and the final mosaics cover about an acre of ground. All the photos were captured in the native Canon RAW format of the S100. To apply the custom white balance for the Infragram photos, I had to open them in Canon’s Digital Photo Professional, the program that comes on a CD with Canon cameras. That preserved the white balance so I could save jpegs for stitching. Then I used Ned’s plugin for Fiji to convert the entire mosaic to NDVI and used Photoshop to make a false color IR image. The dull light produced an NDVI image with little dynamic range, so most plants had similar NDVI values. I adjusted the color balance of the Infragram mosaic to get a little more spread to the NDVI values, but the results are still a little flat. It might be that a slightly different custom white balance would help when the lighting is so dull. Below is a panorama embedded from the the new Photosynth structure from motion feature. This is not the best use of the new feature, but you can see the potential.